Who needs snow for snowmobile racing? Certainly not Walen Brothers Racing. They prefer the open water of a lake. This snowmobile watercross team has been making waves in the upper Midwest for years. 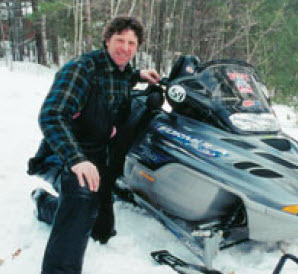 The Ski Doos that Greg and Jim Walen use look very similar to the familiar black sleds that Team AMSOIL/Scheuring Speed Sports ride on the World Snowmobile Association circuit. It’s odd to see snowmobiles on water and you might scratch your head and wonder, “How do they do that?” The sleds are surprisingly buoyant, but speed is the key. There are some modifications to the body, but essentially they’re the same as regular sleds under the hood with AMSOIL products still being the preferred choice. AMSOIL Direct Jobber Lynn Pabst and Dealer Joe Rogers take an active role with the team. Not only do they sponsor the racers, they also work as crew members. Last season Jim had six top five finishes. Greg was in the top ten twice. 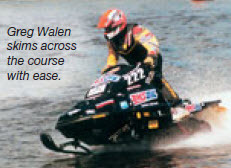 Jim Walen finished the watercross season in the top five five times in 13 events. joins AMSOIL for a great cause. He traded playing on the baseball diamond for playing on Michigan snow years ago. He’s now helping Wertz Warriors and AMSOIL give young people something to remember. In 1976 a young, quirky pitcher named Mark Fidrych broke into the Major Leagues with the Detroit Tigers. “The Bird,” as he was known, was, to say the least, an odd duck. His antics of talking to the ball and housecleaning on the mound drove opposing teams crazy, but made him a darling with media and fans. 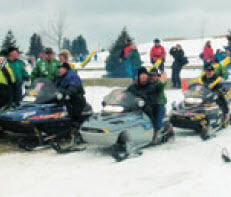 Last winter he joined the Wertz Warriors Snowmobile Club and the Michigan Special Olympics in an annual charity ride. 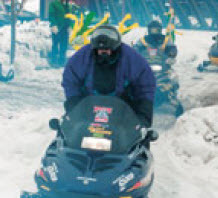 The event co-sponsored by AMSOIL Direct Jobbers Mike Ellis and Tom Kirby takes people, mostly kids, with disabilities on a snowmobile tour through the Michigan countryside. Fidrych was the American League MVP and Rookie of the Year in 1976. 20th for Wertz Warriors. The event gives people with special needs a unique opportunity. Jason Allen of Las Vegas began his racing career in a Legends car. With friend and partner Chris Trickle, Allen quickly made a name for himself and was ready to move up to something bigger. Allen settled into a late model car and found his calling. Unfortunately Trickle wouldn’t be there to see Allen’s success. He would be killed in a driveby shooting. Allen had now found new motiviation. He made a shambles of the late model circuit. 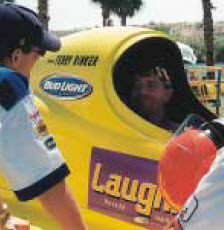 The pinnacle of the 2001 year was the winning of “The July Blast-Off” at The Bullring in Las Vegas. Allen went on to become the 2001 NASCAR Late Model Rookie of the Year and 2001 NASCAR Late Model Champion. Looking for a new challenge, Allen moved up to the NASCAR Featherlite Southwest Series. He saw limited action because of the waning season. He debuted at Las Vegas where he avoided several wrecks and a bad transmission to finish 19th. Allen climbed into the cockpit of his Pontiac Grand Prix for a couple more races. 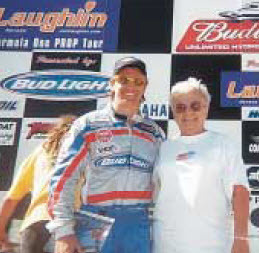 He vows to be back behind the wheel in 2002 with winning on his mind and AMSOIL in his car. The 2011 Monster Energy AMA Supercross Tour kicks off in Anaheim, Calif. on January 8 and will be televised throughout the season on CBS and the Speed Channel. 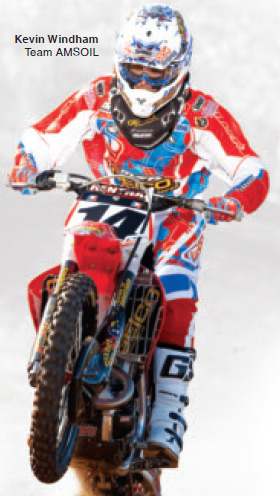 AMSOIL is the Exclusive Official Oil of Monster Energy Supercross and sponsors the AMSOIL/Factory Connection Racing squad that features star rider Kevin Windham and top Lites riders Justin Barcia, Blake Wharton, Eli Tomac and newcomer Wil Hahn. While we might not be “everywhere,” we sure are in a lot of places these days and it’s rewarding to have people taking notice. The question is how are people taking notice? 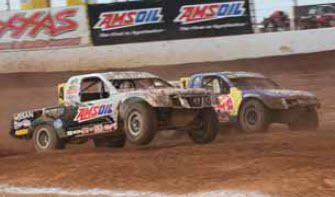 In 2010, AMSOIL had exposure through motorsports sponsorships in more than 500 markets. From Southern California to Maine, AMSOIL was corporately tied to 1,290 race events and more than 5 million fans over the past 12 months. On top of that, AMSOIL race teams, series and events garnered more than 400 hours of television on networks including CBS, NBC, SPEED and Versus. With new series, events and teams being added for 2011, pretty soon “everywhere” will be a reality. AMSOIL Regency Platinum Direct Jobber Shirley Green explains the virtues of AMSOIL lubricants. The cool Colorado River widens below the Davis Dam. It is an oasis between quiet Bullhead City, Arizona and frenetic Laughlin, Nevada. To the east are desert dunes; on the west are gambling chips. 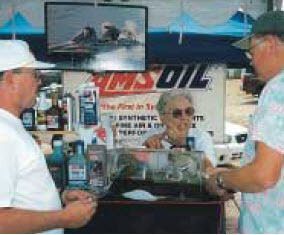 The river also hosts high stakes world-class boat racing, the Formula One PROP Tour of which AMSOIL is a sponsor. 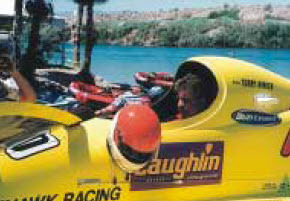 Laughlin is the first stop for the tour each season. The action kicks off in the Mojave warmth to enthusiastic crowds during the first weekend of June. It was a weekend of swimsuits, tanning oil and spectacular racing. Temperatures are expectedly milder in the early summer, but 118-degrees greeted teams this year. AMSOIL lubricants were up to the test and performed exceptionally in the dry heat. Overall, conditions in and out of the water were difficult, but acceptable for drivers. They had to negotiate a swift nine mile-per-hour current on the racecourse, typical for this event because of the dam. On land it was a bit tougher with 30 mile-per-hour wind gusts swirling sand and drying the mouth. Even the most hearty desert dwellers ran for cover when the winds began rushing through the valley. 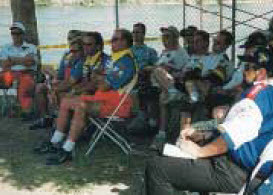 Drivers and crew members get instructions prior to hitting the water. Race weekend starts 8 a.m. Saturday with the drivers meeting. Under the shade of a few palm trees, 16 teams gathered to hear rule changes, ask questions and listen to new sponsors. AMSOIL is on board this season as “The Official 2-Cycle Oil” of the PROP Tour. AMSOIL will also contribute to the year-end contingency point fund. Each team is required to purchase AMSOIL 2-Cycle Oil from the PROP Tour. Each boat carries the distinctive red, white and blue AMSOIL logo. Everywhere a person looked, AMSOIL was there. The boats are essentially airplanes on water. They’re made of wood and carbon fiber. They’re built aerodynamically so that at top speed only the very end of the boat, just a few inches, is in the water. The boat rides on a cushion of air. The engines are outboards, generally Mercury-made, turning out 360–370 horsepower. On this mile-long course drivers will exceed 120 miles per hour. On some courses the boats will do 130 to 140 miles per hour and 150 is reachable. Drivers are able to pilot their boats tightly around floating course markers. The highly maneuverable boats can turn on a dime. 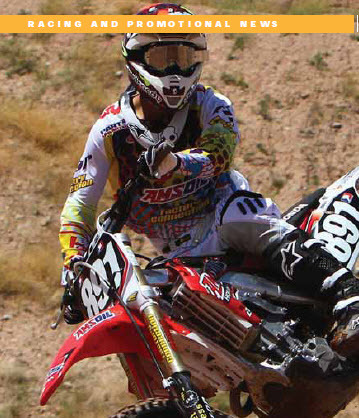 The Blackhawk Racing Team of Terry Rinker uses AMSOIL lubricants. It’s one of the top teams. Rinker rests in boat’s cockpit while getting last minute instructions from PROP Tour CEO Bart Garbrecht. Saturday morning is set for testing. 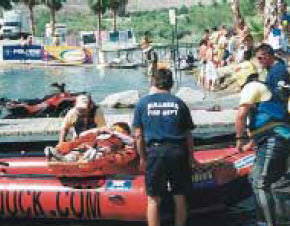 Crews quickly transfer boats from the pits to the water. They put floppy-hat anglers to shame with how quickly they put boats in and out of the water. Helmeted drivers are wedged into the cockpits. Some drivers choose to wear real fighter pilot helmets. All are required to wear an oxygen mask. Later in the weekend it became clear why the oxygen is so important. Saturday’s main event is the race for pole position. Some favorites this weekend are last year’s champion Tim Seebold in his blue Bud Light boat, Greg Foster in the red Sherwin Williams and Terry Rinker is his canary yellow Rinker Boats ride. Shortly after the flag dropped spectators saw the first wreck of the weekend. A boat ran out of space and hit a marker buoy. The boat flipped and tumbled straight toward the shoreline. Fans bolted from their seats, but they were never in any real danger. Debris floated down river as rescuers quickly pulled the driver from the boat. The safety equipment worked perfectly and the driver was fine. As a precaution, all drivers involved in accidents are brought in on a stretcher to be checked out by medical personnel. Rinker won the pole for this event. The fastest time for the AMSOIL lubricated boat was 28.6 seconds and 125.7 miles per hour. That wasn’t bad considering this was a rough course and the first race of the year. Rinker’s crew has been sold on AMSOIL for years. Blackhawk / Rinker’s Crew Chief James Chambers says he’s been sold on AMSOIL since the days he was behind the wheel 20 years ago. Shirley Green and driver Tim Seebold are all smiles after first AMSOIL-sponsored Formula One PROP Tour win. Seebold is reigning series champion. Sunday’s conditions were much the same with temperatures in the triple digits and a stiff breeze. The feature was an exhibition of watercraft wreckage. Five laps in and the first wreck happened. A favorite to win, Greg Foster, flipped over. He was fine, but his boat was totalled. It floated away in the river current to be retrieved later. Five laps later, Carlos Kuri, a crowd favorite, lost control of his fine boat. His shredded Telmex boat remained upside down for several minutes. The crowd grew edgy. Kuri was pulled from the boat, shaken, but all right. While crews worked in the wet pits to realign the remaining boats, bikini- and shorts-clad viewers got a chance to get a drink and reapply the sunscreen. Temperatures were still above 100 degrees. Finals are 40 laps and generally take 20 minutes or so to complete. By this time drivers had been in their harnesses for nearly an hour. At the drop of the flag, the remaining boats were on their way, 30 laps to go. The boats sound like jets tearing across the water. Drivers jockey for clean water as they try to stay out of the rooster tail spray of the other boats. Terry Rinker continued his dominance. The power he showed winning the pole had carried over to the final. Safety team rescues driver after his boat flipped. The driver was uninjured. A dejected Rinker thinks about what might have been. A tripped fuel switch (in green triangle on boat) cost him a win. He led after every restart. It looked like it was going to be his day. Thirty-four laps in the books and disaster struck. A fuel switch got tripped on the side of Rinker’s boat causing it to shut down. Reigning champion Tim Seebold seized the moment and finished the final four laps in first place. Seebold got an early start in retaining his title. Rinker’s team would settle for eighth. The Colorado River acts as border, but it also separates the skilled from the unproven. It can be beautiful, yet treacherous. This Formula One PROP Tour race proved that anything can happen in racing and that AMSOIL lubricants are the choice of front-runners. Bob Teague and Paul Whittier collected two more checkered flags in Michigan. 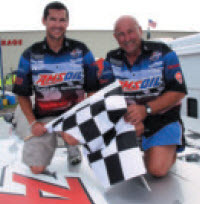 After taking a win in Harrison Township, Mich., Team AMSOIL offshore racers Bob Teague and Paul Whittier began preparations for the hotly-contested Saint Clair River Offshore Race in Saint Clair, Mich. the following weekend. Upon the start of the Saint Clair River Offshore Race, Team AMSOIL ran on the outside of the very fast Team Phoenixparts.com boat through the first two turns and down the back straightaway. On the first lap going into turns three and four, Team AMSOIL correctly anticipated that Team Phoenixparts.com would push them on a wide line at the turn, and they used it to their advantage, successfully passing on the inside, steadily increasing their lead for the remaining 15 laps and taking the victory. Teague and Mike Defrees competed next at the second annual Great Lakes Grand Prix. With winds close to 20 MPH whipping up Lake Michigan, Team AMSOIL worked hard to keep within striking distance of Team Stihl, but finished a strong second in the 80 mile race. Team AMSOIL currently holds first place in the SBI National Standings and OPA/Geico Series. 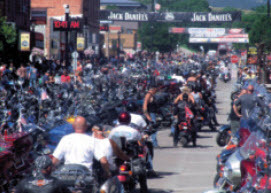 Attendance at the 70th Annual Sturgis Motorcycle Rally was up from previous years, drawing an estimated 750,000 people. The 70th Annual Sturgis Motorcycle Rally took place August 9-15, drawing an estimated 750,000 motorcycle enthusiasts and potential AMSOIL customers to the Black Hills in Sturgis, S.D. for the week-long event. With AMSOIL in its third year as the Official Oil of the world famous rally, the company’s visibility was larger than ever. A large AMSOIL banner once again greeted visitors as they entered town on Junction Avenue, and with 90 AMSOIL signs gracing the many barricades located throughout the downtown area, the AMSOIL logo was impossible to miss. The AMSOIL booth was buzzing with potential customers each day of the rally. Thousands of people walked by the AMSOIL booth each day, where AMSOIL corporate staff were busy spreading the word about the many benefits of AMSOIL products. Temperatures reaching over 100°F provided a perfect opportunity to promote the high temperature benefits of AMSOIL synthetic motorcycle oils. 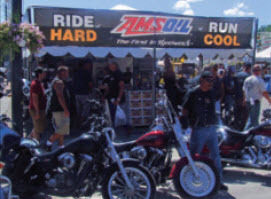 AMSOIL established a corporate presence at Sturgis in 2006 and signed on as the Official Oil in 2008. 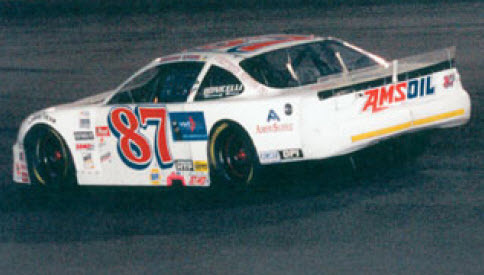 Burney Lamar, driving the AMSOIL car for Bonicelli Racing, won the NASCAR Featherlite Southwest Series 2001 Rookie of the Year. Lamar clinched the award in Tucson, Arizona at the season finale. Lamar qualified third, won the “Trophy Dash” and finished the 150-lap feature event in eighth place. This was the first title for the AMSOIL using team from Colorado Springs, Colorado. 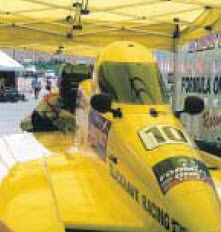 Lamar and Bonicelli had 12 top twenty, seven top ten and one top five finishes on the Southwest Series in 2001.